At most summer camps, “bedtime” means ghost stories, giggling and maybe sneaking into the opposite gender’s cabin. At Camp Happy Days, beds are for decorating, team-building and racing, at least once every May. This week, I spoke with Elizabeth Clark of Charleston, SC’s Camp Happy Days, a week-long camp for kids diagnosed with cancer, and their siblings. Camp Happy Days runs eleven programs throughout the year for children and families affected by childhood cancer, and the bed race is one of their most notorious fundraisers. Don’t let these threadbare beds fool you – they’re supporting a much higher cause. Every summer, 1,500 South Carolina kids ages 4-16, arrive at Camp Happy Days for a week of water sports, dancing, crafts and cookouts. They get to spend seven days playing – and being treated – like normal kids. “The cool thing about it is that you can’t tell which children are sick and which ones aren’t because they’re in this environment when they feel normal and accepted,” Elizabeth said. In order to make sure their campers needs are covered, Camp Happy Days includes a full medical staff, including on-call doctors and nurses. They even have places for campers to receive their chemotherapy treatments and other medical necessities. And sometimes, campers don’t return the following year. Yet, what could be a downside of congregating hundreds of sick kids becomes a community of healing. Camp Happy Days works with siblings and friends of passed campers mourn and memorialize their loved ones. The annual bed race isn’t the biggest fundraiser for Camp Happy Days, but it is the most outlandish. 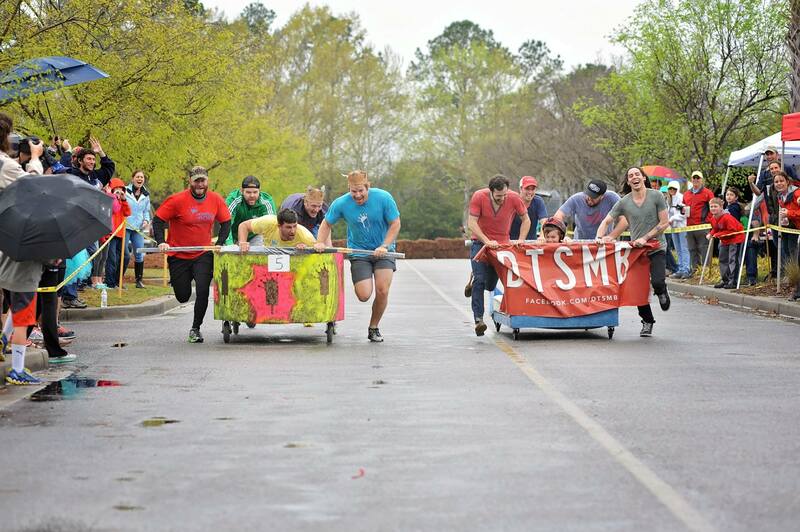 For seven years in a row, teams of five (one rider and four pushers) have competed in 1 v. 1 bed-racing heats for an array of prizes, including “fastest bed,” “slowest bed,” and the “what were you thinking?” award. Bed race rules include a measurement restriction – at least 3 feet by 6 feet, but no more than 6 feet by 8 feet – and other must-haves, like an actual mattress, four wheels and a rider. (Read more on the offical bed race website.) Most racers come from the Charleston community, Elizabeth said, though Camp Happy Days does invite its campers and their families to the event, to show participants who they’re really competing for. Elizabeth (in blond hair) visits a Camp Happy Days patient with her colleagues. The Charleston community is a great mix of old money and new, which brings a lot to the table when it comes to fundraising. Besides the bed race and an annual gala, most of Camp Happy Days’ donations come from grants, sponsors and private donors, Elizabeth said. Many connections come through board members and volunteers. One area of Camp Happy Days service that has a lot of need is their financial crisis assistance. A lot of our families are in the lower income, so a child’s cancer diagnosis is especially devastating, Elizabeth told me. Plus, if you have a child in the hospital, a parent often has to be with them 24-7. Parents often have to quit their jobs to meet this need, which adds even further strain to the family’s financial situation. In addition to financial services, Camp Happy Days holds year-round programs meant to uplift the lives of children with cancer. Around Valentine’s Day, for example, they visited kids in hospitals around South Carolina with singing stuffed animals valentines. 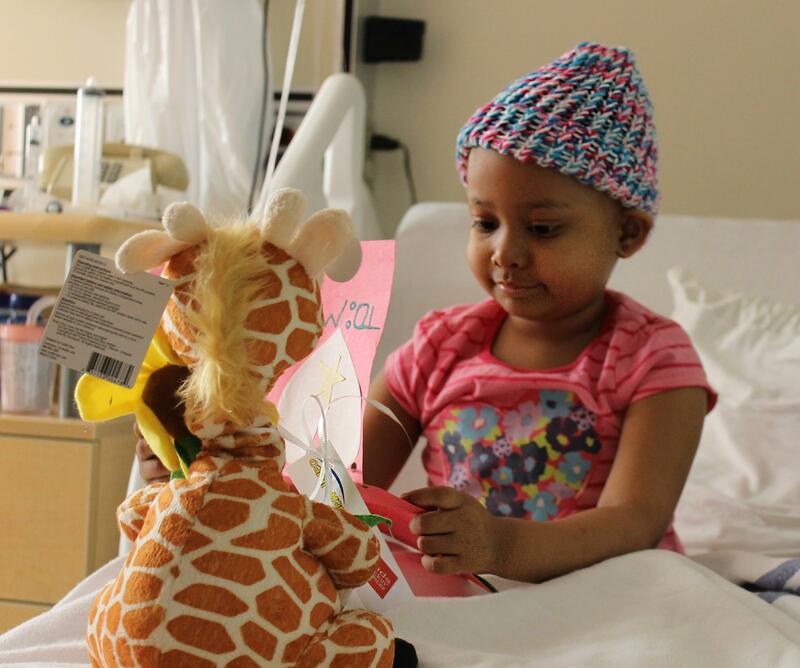 A young patient enjoys her Valentine.photo thanks to Camp Happy Days. But these gifts and programs and the annual camp are for more than smiles. Because, Elizabeth says, one week of joy may have the effect of a lifetime. Watch the Camp Happy Days video here for a taste of the adventure.